A suicide bomber killed a leading cleric who spoke out against the Taliban today in Lahore after prayers. A leading anti-Taliban cleric has been killed in a suspected suicide bomb attack at his Islamic religious school in the Pakistani city of Lahore. The explosion struck the Jaamia Naeemia madrassa around the time of Friday prayers, killing Sarfraz Naeemi, who often spoke out against militants. 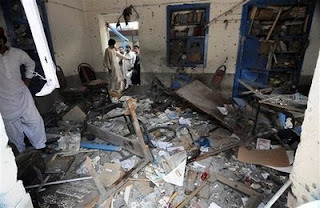 Another blast hit a mosque close to a military depot in the north-western garrison town of Nowshera. At least six people were reported dead in the simultaneous suicide attacks. In Lahore, the senior cleric at the Jaamia Naeemia madrassa, Sarfraz Naeemi, was greeting visitors in his office after Friday prayers when the suicide bomber managed to get inside and detonate explosives.